French-based NewHeat is a rapidly growing start-up. About two years after it was founded in December 2015, management has raised almost EUR 1.8 million from private investors to finance the first solar heat delivery projects and strengthen its global sales force. NewHeat, headquartered in Bordeaux, France, calls itself an independent integrated solar heat producer aiming at end customers in district heating and industry. The company is also an industry member of Task 55 of the IEA Solar Heating and Cooling programme, Towards the Integration of Large SHC Systems into DHC Networks. CEO Hugues Defréville (left photo) and CTO Pierre Delmas not only established the start-up two years ago, but have knowledge and skills that complement each other to advance the business. Over the last ten years, Defréville managed renewable-based IPP (independent power production) projects totalling around EUR 500 million. Delmas used to work in project engineering at renewable component manufacturers in Canada, France and Spain. Delmas said that the regular Task 55 meetings were an excellent networking opportunity for talking to other research and industry stakeholders in district heating and “have access to the world’s most comprehensive knowledge base on that issue”. NewHeat offers heat supply contracts to end users in industry and district heating, but with the intention to isolate the contractual relationship from its own business. 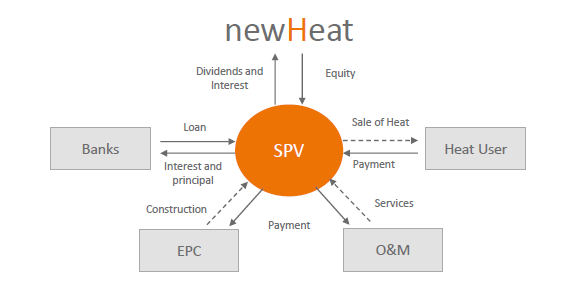 The heat supplier uses a project business model called special purpose vehicles (SPVs), established in renewable IPP project circles, to reduce the risks to financial institutions (see the diagram below). While the SPV owns the assets of the solar heat installation, it is a business with no staff and has the sole purpose of financing and operating one or a package of SHIP projects. It is the signee of all relevant documents: the EPC (engineering, procurement and construction) contract with the turnkey system supplier, the heat supply one with the industrial end user, the O&M agreement with a service provider and the loan / financing one with a bank, private investor or structural fund. NewHeat lends manpower to the SPV for project administration and aims at remaining the majority shareholder. “The SPV model makes it possible to optimise and de-risk all contracts, so that third-party investors can become shareholders in a completely enclosed project with low-risk IRRs independent of newHeat’s business development,” explained Delmas. Naturally, what is important is a well-drafted EPC contract including guaranteed performance requirements. NewHeat’s business model creates independent heat producers for industrial and district heating end users. SPV is short for special purpose vehicle and EPC includes engineering, procurement and construction. One of the first steps in project development is a software precheck to determine the financial and technical feasibility of any SHIP investment. If this leads to a positive outcome, it will be followed by an assessment for the building permit and administrative matters. “A careful assessment at this early stage can save you a lot of money during the construction of the solar heat plant,” emphasised newHeat’s CTO. The third step is to structure the investment properly. NewHeat has a staff of eight, including one PhD student. Delmas expects a first SPV business to be established for a SHIP project by the end of this year and the first SDH project to be realised in 2018.